N.E. 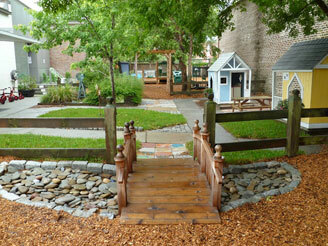 Miles Early Childhood Development Center began planning their Nature Explore Classroom with a concept plan where objectives included physical and permanent features, environmental factors, observation of children playing and identification of under-used spaces and areas. The grounds crew supervisor developed a long-range plan based on the Nature Explore standards and principles. Children were invited to name activity areas and then drew pictures for each of the places where signs were needed. There is a focus on native species of trees, shrubs and plants that are both safe and durable. The outdoor classroom includes a nice mix of mature and young trees. 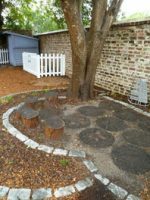 Seasonal gardening typically represents the interests of the children and opportunities to observe life cycles. Growing pumpkins, gourds, milkweed, and pole beans has shown children how plants grow rapidly over such a short time. The classroom serves as a demonstration site for the University’s sustainability initiative. A small rain-water harvesting system provides some water for irrigation and watering of plants by the children. Children also learn from recycling and composting at the Center. 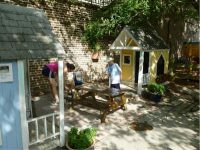 Located on a historic property, the Nature Explore Classroom is surrounded on three sides by old brick walls. Paint and other elements included are mostly dark green or brown to provide a nice backdrop for accents of grasses, flowering bushes, plants, and murals. Wood structures were built with pressure-treated lumber and other components are made of certified recycled plastic. Shade is provided by trees, lattice and canvas. 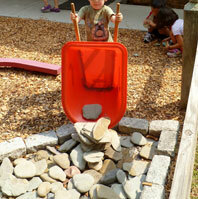 Children enjoy a rock pond, including large stones and fossil rocks which have been incorporated as a central feature of the Messy Materials Area. The children spend a great deal of time moving, sorting, examining, comparing and stacking them. A favorite major undertaking, which occurs several times a year, is to remove all the rocks, clean out the leaves and debris, wash all the rocks and put them back in place. Resources have been compiled into a binder which is shared with parents. These resources include articles highlighting research on the benefits of outdoor education. Entries are posted regularly on the program website and in classroom newsletters about activities and learning that occur outdoors. A standing committee of parents helps renovate the space and continues to provide volunteer support for maintenance and help to brainstorm new ideas. 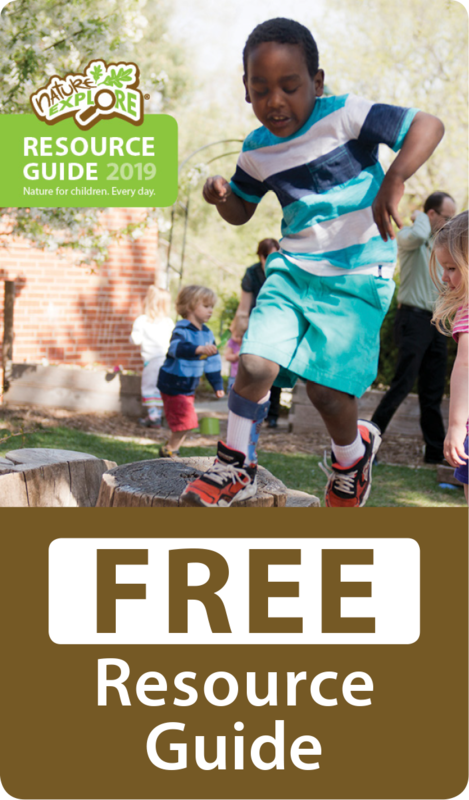 Events are planned each year that focus on connecting children and families with nature.